The evocative aroma of rose essential oil is probably one of the most recognisable and well loved. Rose oil is often thought of as the queen among essential oils and it well deserves this reputation. It is one of the most precious oils and very expensive as it is difficult to process. However, the 'otto of roses' is so highly concentrated that only a very small amount is needed for each treatment. It is certainly worth having a bottle to hand as rose works on nearly every system in your body - how fantastic is that! This is very much a feminine oil and I tend to use it in aromatherapy massage with older women because it is particularly good for mature skin as well as being a wonderful remedy for many female problems. Rose oil also works naturally and gently in easing depression, grief and sadness. 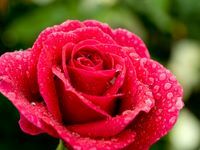 We musn't forget that rose is also a well known natural aphrodisiac and is used by both men and women for this quality!. Bulgaria, India, Morocco, Turkey, France. A small amount by distillation but the majority by enfleurage or solvent extraction. Chamomile, lavender, jasmine, clary sage, geranium, black pepper, ylang ylang, patchouli, bergamot, orange, sandalwood and many more! Antiseptic, antidepressant, astringent, aphrodisiac, emmenagogue, tonic, sedative, vascoconstrictor, detoxifying, hepatic, antispasmodic, haemostatic. Rose essential oil is a mood enhancer, great for healing our emotional wounds. It helps relieve melancholy, depression, disappointment, sadness, grief and heartache. Due to its low toxicity rose otto is a safe choice for children. It helps balance hormones so is terrific for PMT and the menopause. Useful for circulation problems and balancing blood pressure. Helps mental fatigue, exhaustion and stress and aids memory. Rose oil is one of the most antiseptic of essences. Superb as a stress reliever and symptoms such as nervous tension and peptic ulcers. Rose has a powerful tonic effect on the nervous system, stomach, liver and spleen - not often used because of the expense and because there are other essential oils that are equally as effective. Can be used to help women suffering from frigidity and men suffering from impotence. Its antiseptic, tonic and soothing qualities make it great for general skincare, but it is particularly good for mature, dry and sensitive skin. It is also vascoconstricting which makes it good for reducing redness. Rose essential oil is an emmenagogue so avoid in pregnancy. Be careful as oils sold as 'Rose' have often been adulterated. The rose was probably the first flower ever to be distilled into an essential oil.